Join us for an exciting evening of toe-tapping Cape Breton Guitar with five of Cape Breton’s finest guitarists! Featuring Maxim Cormier, Gervais Cormier, Pius MacIsaac, Mitch Poirier and James MacLean. The concert will feature traditional tunes, original material, and a few surprises. Cape Breton Guitar is on May 3rd at 7:30PM and advanced tickets are go on sale Wednesday, February 7! Pius MacIsaac, from Mabou, is a regular performer at the local festivals and parish hall dances that intrigue so many of the island’s visitors. A gifted composer, Pius has written about fifty tunes which he performs on his violin and mandolin as well as his guitar. He is a sought-after artist in Cape Breton and can be seen accompanying many of the island’s top fiddlers with his driving, percussive guitar rhythms. Pius has recorded on four CDs and has played with Natalie MacMaster, Gordie Sampson, Scott Macmillan, Ian MacDougall, and Kinnon Beaton. 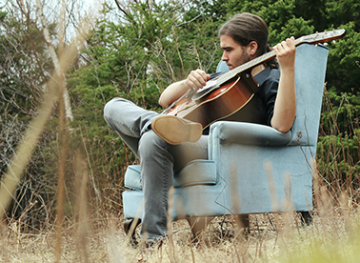 Hailing from East Lake Ainslie, Cape Breton, James MacLean has been playing music for over 15 years. He started from a young age taking piano lessons from the late Marianne Jewell, but then migrated towards guitar. It was in his late teens when he began lessons with Cape Breton guitar sensation, Brian Doyle, that his love for traditional Cape Breton music began to blossom. After high school, James decided to pursue a degree in music, and under the tutelage of Scott MacMillan, earned his Bachelor of Music from Dalhousie University in 2015. James can be heard playing alongside his aunt Karen Beaton a few times each summer during her weekly concerts in Mabou and Antigonish, as well as various other events around Inverness County. James does his best to emulate his former teachers when flat-picking Traditional Scottish tunes, and other genres such as classical and bluegrass. He hopes to release a solo album in the near future. Mitch Poirier is a 17 year old singer/songwriter & multi intrumentalist (guitar, piano, bass, & drums) from Inverness, Nova Scotia. Mitch has been playing music since the age of 9 and has become a unique performer with his instrumental guitar style which at age 14 garnered an Atlantic Canada Under 19 Guitar Championship at the East Coast Guitar Festival. Mitch has performed on small and large stages over the last 8 years and as a singer/songwriter has recorded original music at Codapop Studios in Halifax. Mitch has had the opportunity to share the stage with noted performers such as The Town Heroes, Heather Rankin & Rawlins Cross.